Can Felipe is a spacious, luxurious villa. It is newly built and is suitable for eight people. 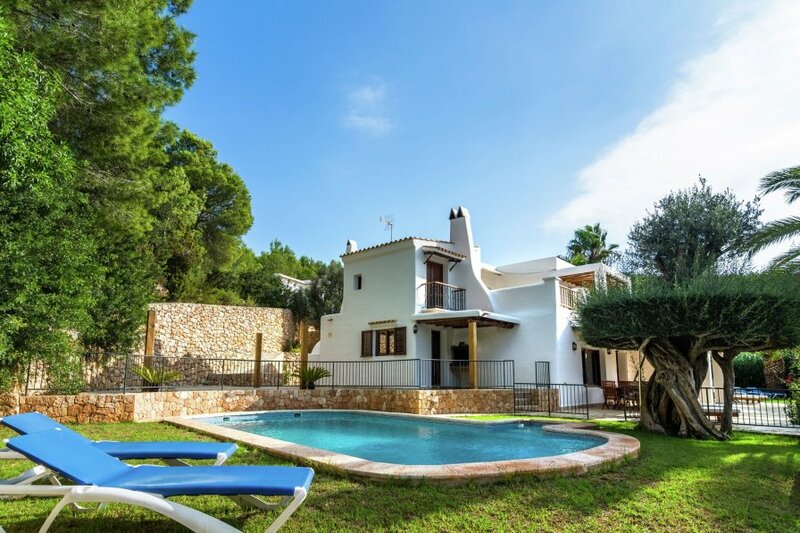 The villa is in typical Ibiza style and on a hill two kilometres from the town of Santa Eulalia. Santa Eulalia is the third largest town in Ibiza. It has an attractive, pleasant boulevard with many little restaurants and bars. Youll find shops, banks, supermarkets, a morning market, a marina and the famous Restaurant Street here. Ibiza Town is fifteen kilometres away. The 8 metres x 5 metres swimming pool has a sun terrace with sun loungers and parasols. There is a terrace with a barbecue area and a teak dining table for eight people next to the pool. The terrace enjoys beautiful views of the sea, the hills and the little church of Santa Eulalia. The living room has a high ceiling and a large, eight-person dining table. It has a comfortable seating area with an open fireplace, satellite TV, music-centre, video and an attractive covered terrace. The kitchen is next to the living room and is equipped with a microwave, oven, ceramic hob and fridge freezer. The kitchen has access to the same terrace as the living room. You'll find a washing machine in a separate area. There is a twin bedroom on the other side of the living room. There is also a bathroom with a shower, wash basin and toilet. A second bedroom has two single beds and a bathroom with wash basin and toilet. Youll find a lounge area with comfortable sofas on the first floor. This area has access to a spacious balcony with a pleasant seating area and beautiful views. The master bedroom with its double bed is on the right. It has a large bathroom with double wash basin, toilet and bath with shower and jacuzzi. The fourth bedroom is on the left. It has a double bed and a bathroom with wash basin, shower and toilet. All bedrooms have wood floors and air conditioning.